This film was released to buy on April 24th, and it stars the two biggest filmstars in France!. 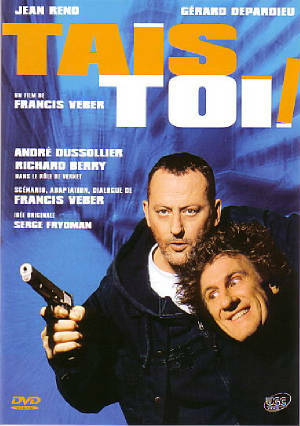 One being, Jean Reno, and the other, Gerard Depardieu. 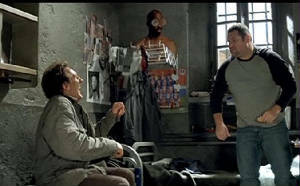 It starts of with Quentin (Gerard Depardieu), who seems a bit simple minded, trying to rob le bureau de change in mistake for a bank, he ends up in jail. Ruby (Jean Reno) is having an affair with the wife of a big time crook. The big time man finds out and murders his wife, Ruby ends up robbing the men who have just held up of a security van, these men were the big time mans stooges, so Ruby ends up in jail too. Quentin is the kind of guy who can't keep his mouth shut in jail, he gets into trouble because he doesn't keep his thoughts to himself, but he can fight his own way out of it and is moved from cellmate to cellmate. Ruby however, won't say a word to anyone, he is heartbroken and wants revenge on the man who killed his love. Quentin and Ruby end up in the same cell, Quentin is always talking, Ruby says nothing, he just looks into space all of the time. One night, Quentin wakes up to find that Ruby has slashed his wrists, he calls for help. Ruby ends up in a psychiatric ward, not long after, Quentin does something stupid and ends up there too, he wants to be with his new found friend. Quentin ends up making a phonecall, him and Ruby end up escaping with a bit of help from a mate and a crane. Once out of prison, Ruby keeps trying to get rid of Quentin, he doesn't want him cramping his style whilst he's out to get his revenge. There are lots of laughs and lots of action to be seen on this film, it's like a cat and mouse game, and even though ruby is trying to get rid of Quentin all of the time, they always end up saving each others skins.